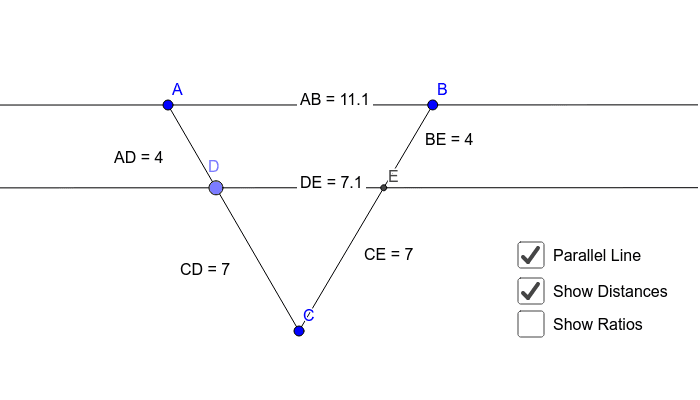 Below is a simple diagram with line AB, point C, and point D on segment AC. Take a moment to drag the points around to see how it behaves. Now use the checkboxes to: ﻿1) create a parallel line through D ﻿2) measure distances AD, CD, BE, CE ﻿3) compare the ratios Feel free to estimate when using the ratios as the values are not perfect. How do the angles of triangle ABC compare to the angles of triangle DEC? Note that we can do the same comparisons using AB and DE to show they are proportional.